What is the Maratona dles Dolomites - Enel? The “Maratona dles Dolomites - Enel” is a large-scale event for touring cyclists. It is a road bicycling race on three possible routes: Maratona Course (138 km), Middle Course (106 km) and Sellaronda Course (55 km). The Sellaronda course does not foresee an official classification. Where is the start and the finish of the race? The start of the race is in La Villa – Alta Badia – Dolomites (BZ) – Italy and the arrival in Corvara – Alta Badia. Who can partecipate to the Maratona dles Dolomites - Enel? The Maratona dles Dolomites - Enel is open to all adult male and female riders over 18 (eighteen) years. Professionals and cyclists of the Elite category who have a Professional or a Continental contract in 2019 or in the last 4 years (2015 – 2018) are not admitted to the race. For females the same rule applies but it is limited to 2019 and the last 2 years (2017 – 2018). Cyclists (male and females) with an Elite license without contract in 2019 or in the last 2 years (2017 – 2018) are not admitted to the race. U23 athletes can participate if they are not in the temporal conditions which do not allow the enrolment as amateurs cyclist: for the 2 years following the last membership in the category; U23 athletes with an only year of membership in the category: for 1 year following the last membership in the category. Professionals can be admitted exclusively for promotional purposes and subject to invitation by the Organizing Committee and may not take part in any way in the ranking. Cyclists older than 64 (sixty four) may just run the shortest courses (55km and 106 km). The 2019 Marathon is by invitation and the Organising Committee may decide at any time whether to accept or not the enrolment or to exclude at any time an enrolled contestant for the event that may damage the image of the event. No registrations from participants who have been sanctioned by Sporting and/or Ordinary Justice, for a period of time longer than 6 (six) months, for reasons related to doping will be accepted. The 2019 Marathon has a closed number of registrations to be divided equally between Italian and International contestants. The cyclists who have not regularly registered for the race cannot join the groups, on pain of exclusion. In the event of an accident, they will be reported in accordance with the law. 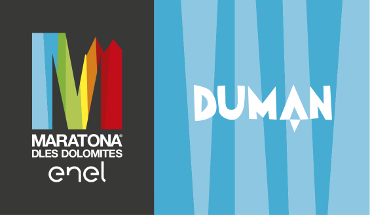 What is the mininum age in order to partecipate to the Maratona dles Dolomites - Enel? The Maratona dles Dolomites - Enel is open to all those who have completed 18 (eighteen) years. Cyclists older than 64 (sixty four) may just run the shortest courses (55km and 106 km). Which are the entry procedures for the Maratona dles Dolomites - Enel 2019? - Online pre-registration with participation to the draw. The pre-registrations are open from October 18th 2018 to November 8th 2018; the draw takes place in the second half of November 2018. - charity registrations which will be sold online on www.maratona.it on November 28th 2018 and on March 28th 2019.
Who are the “fidelity members”? Fidelity members, are those members who have participated and have concluded at least 13 (thirteen) editions of the Maratona. In 2020, to be included amongst the “fidelity members” it will be necessary to have completed 14 (fourteen) editions and from 2021 15 (fifteen) editions. Which is the entry procedure for the “fidelity members”? The fidelity members have the right to be admitted to the Maratona dles Dolomites - Enel. However, they must pre-register. By doing the pre-registration they will automatically be admitted to the race without having to take part to the draw. Those fidelity members who don’t pre-register will not be admitted to the race. Which is the entry procedure for those who have transferred the registration from 2018 to 2019? Those cyclists who announced a withdrawal for the 2018 edition within the requested deadline will get an email in October 2018 with the indications on how to confirm the registration for 2019. The pre-registration does not need to be done. Those who buy a package accommodation+registration need to do a pre-registration? The cyclists who buy a package accommodation+registratoin don’t need to pre-register. How does the repechage for the Maratona dles Dolomites - Enel 2019 run? Pre-registered participants not drawn for the 2019 edition and reported in the pre-registration list but not in the list of drawn participants and starting list of the last 5 (five) editions 2014, 2015, 2016, 2017 and 2018 will be readmitted to the race. How do I confim my entry? The participants drawn as well as the registrations not subject to the draw can confirm their entry from December 3rd 2018 till April 18th 2019 by using the individual code which will be communicated them by e-mail. All pre-entries not confirmed by that deadline will automatically be annulled. Registration can be considered completed and regularly carried out, save sanctions by the FCI (Italian Cycling Federation) on arrival, only when the participation fee has been paid in full and a copy of a valid medical certificate according to the Italian D.M.V. 18/02/1982 has been sent and the modification of the participant’s status to “ok, complete” in the official list of participants on the site. The medical certificate must not be dated more than one year prior the date of the event. Following sentence must be included in the medical certificate: “The subject, according to the clinical investigations carried out, does not present any contraindication related to competitive cycling activity”. At any time it is possible to see if the entry has been accepted or not and to check the own enrolment status on our website www.maratona.it. When do I have to select the route of the Maratona? Are there any restrictions in the selection of the route? There are 3 possible routes for the 2019 Maratona dles Dolomites - Enel. Participants are free to select the route best suited to their ability, also during the course of the event, entirely according to their own judgement. Cyclists older than 64 (sixty four) may just run the shortest courses (55km and 106 km). How does the division into starting groups run for 2019? The division is based on point 3 of the Conditions of Entry 2019; the times refer to the last 4 editions of the Maratona dles Dolomites - Enel (2015, 2016, 2017 and 2018). Where and when does the starting number pick-up take place? - Wednesday, 03.07.2019 from 8.30 p.m. to 10.30 p.m.
- Thursday, 04.07.2019 from 8.30 p.m. to 10.30 p.m.
- Friday, 05.07.2019 from 2 p.m. to 7 p.m.
- Saturday, 06.07.2019 from 10 a.m. to 7 p.m.
Who and how can pick-up the starting number? The starting number needs to be picked-up personally with an original valid ID (identity card, passport or driving license) and on handing over the voucher (which will be send by email in June). No copies of ID’s or other ID’s allowed. A pickup from third parties is not accepted. When is the assembly point and at what time is the start of the Maratona dles Dolomites - Enel? The assembly is possible as from 5.30 a.m. and the start of the race is at 6.30 a.m. Anybody who has not entered the grid 15 minutes before the start will be automatically diverted to the last starting grid. Are the roads of the race open to the traffic? The roads will be closed to traffic (including cyclists) during most of the race. The closure timetable of the roads will be published as soon as the responsible authorities will confirm the times. Is it possible to have a private mobile and mechanical assistance following me? The assistance of private vehicles following the race is strictly prohibited, under penalty of disqualification of the athlete. When and where does the official prize giving ceremony take place? Who will be awarded? The official awards ceremony will take place at 4 p.m. in the ice stadium. Following prizes will be handed over: the top 5 (five) teams of the team classification, the first 3 (three) in the overall individual classification and the first classified in each category for the medium and Maratona distances. The Sellaronda course does not foresee an official classification. Prizes will be handed over only to winners taking part at the ceremony. How do I get to ALTA BADIA? • highway A22 "Brennero" to Varna-Bressanone; state road SS49 "Val Pusteria" (Brunico) to San Lorenzo; state road SS244 "Val badia" to La Valle. • highway A22 "Brennero" to Chiusa; state road "Val Gardena" to Passo Gardena and Colfosco. • highway A27 to Belluno ; state road SS51 to Cortina d'Ampezzo, Passo Falzarego, Valparola, San Cassiano. Further you can find in La Villa an equipped parking area for campers.